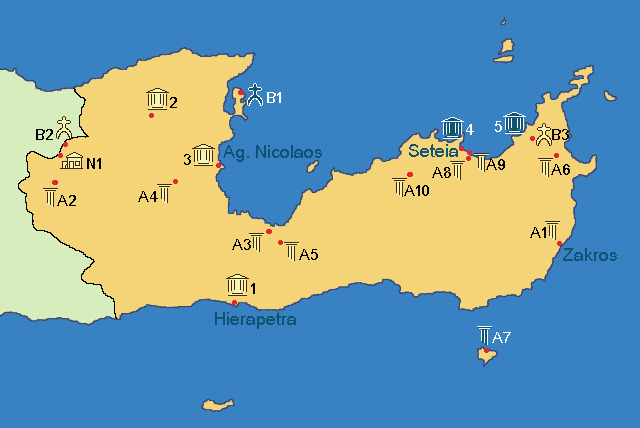 The prefecture of Lasithi is at the East End of Crete. It is the land of alterations. The combination of wild- mountain beauty with green fertile valleys, along with picturesque villages and modern cities compose this unique beauty. Lasithi is consisted of three big cities. Agios Nikolaos, the prefecture’s capital, Ierapetra, the nymph of Libyan sea as people call it, and Sitia, with untouched – from time and human finger – beauties. In Lasithi you will swim in beautiful beaches and visit picturesque villages. Worth visiting are Elounda, Sissi, Koutsounari, Agia Fotia, Myrto, Makrys Gialos, Palekastro and of course Vai, the only phoenix forest in Europe. Meet the unique history of Lasithi as it is revealed in the archaeological sites and monuments all around the prefecture. The remains of the ancient town Lato, the palace of Zakros, the minoan settlement in Palekastro, the temple of Dikteos Zeus, the castle Kales, Spinaloga and the byzantine monasteries draw a unique route through time.